JNT3771JC : Jonti-Craft Jonti-Craft Komfy Chair - Fabric Espresso Seat - Baltic - Acrylic - 26.5" Width X 19.5" Depth X 23"
Jonti-Craft Komfy Chair - Fabric Espresso Seat - Baltic - Acrylic - 26.5" Width X 19.5" Depth X 23"
This Comfortable Chair Is Designed With Style And Sized Perfectly For Children. High-Density Foam Cushion Provides Exceptional Comfort And Is Wrapped With Extra-Durable Fabric. Ultraviolet Acrylic Coating Is Durable And Resists Yellowing Over Time. Dowel-Pin Construction Prevents Weakening At The Joints. Kydzsafe Rounded Edges Allow Children To Play Safely Without Getting Hurt By Sharp Edges Or Corners.. 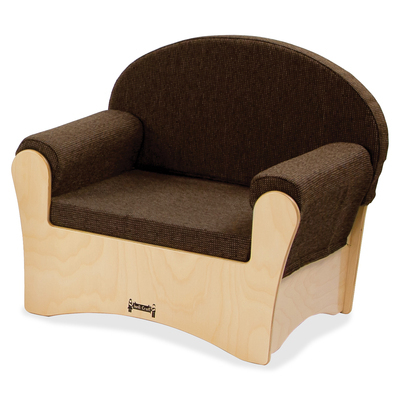 This Comfortable Chair Is Designed With Style And Sized Perfectly For Children. High-Density Foam Cushion Provides Exceptional Comfort And Is Wrapped With Extra-Durable Fabric. Ultraviolet Acrylic Coating Is Durable And Resists Yellowing Over Time. Dowel-Pin Construction Prevents Weakening At The Joints. Kydzsafe Rounded Edges Allow Children To Play Safely Without Getting Hurt By Sharp Edges Or Corners.